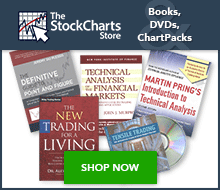 StockCharts publishes a series of “theoretical” indices that show an idealized pattern or trading sequence. For example, $THEW charts an ideal Elliott Wave sequence with three waves up and two down. $THHS charts a classic head-and-shoulders pattern on the chart. These indices can be used to understand how indicators react under these theoretical conditions. StockCharts.com users can access an up-to-date list of symbols for all our Theoretical Indices. From this list, click the “Mentions” icon to the right of a specific symbol for more details about the symbol, as well as recent mentions in Public ChartLists, blog articles, and more.